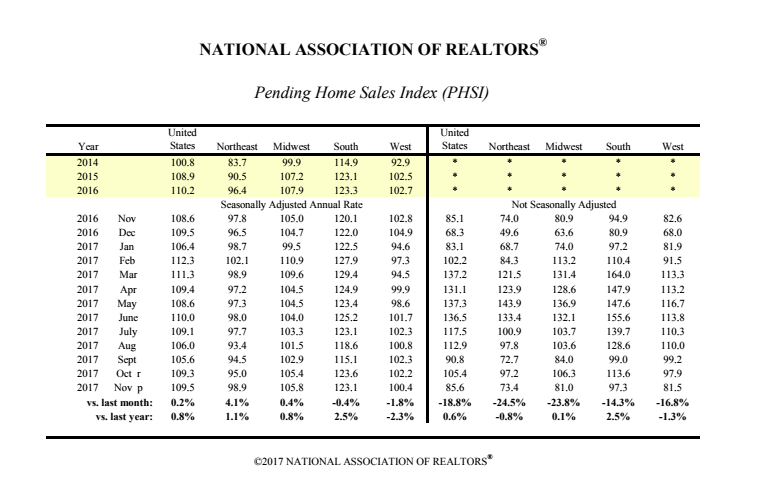 The National Association of Realtors (NAR) Pending Home Sales Index (PHSI), a forward-looking indicator that tracks homes sales in which a contract is signed but the sale has not yet closed, increased 0.2 percent in the month of November to 109.5 from 109.3 in October. NAR Chief Economist Lawrence Yun credits the small gain in November to a strong jobs market and overall healthy economy. But Yun expects pending home and existing home sales to slow in the coming year, due to continued inventory shortages and concerns about how the tax bill will impact homeowners and buyers in high-priced markets. “The housing market is closing the year on a stronger note than earlier this summer, backed by solid job creation and an economy that has kicked into a higher gear,” said Yun in a statement. “However, new buyers coming into the market are finding out quickly that their options are limited and competition is robust. Realtors say many would-be buyers from earlier this year, stifled by tight supply and higher prices, are still trying to buy a home. 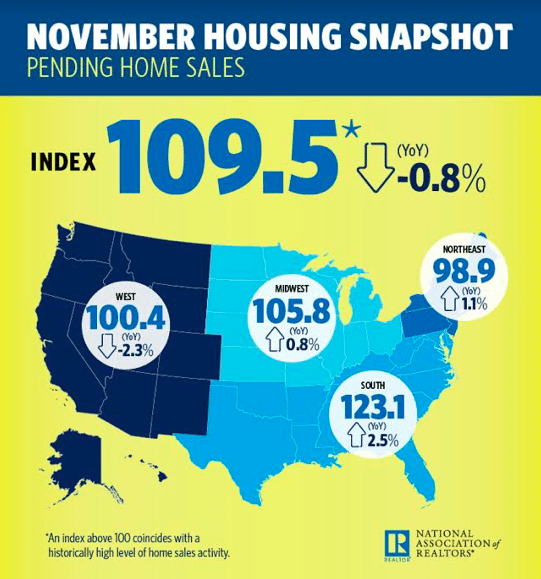 November’s PHSI marks the highest recorded since June (110.0), and is 0.8 percent higher than a year ago. Inventory has continued to decline for the 30th consecutive month with levels at a 3.4-month supply. Yun expects existing home sales to finish 2017 at around 5.54 million — a 1.7 percent increase over 2016 (5.45 million).